A second colour seems like a good choice. You could paint with the right mouse button too. Of course you lose the ability to select objects with right click while you have a paint tool - but as that is already the case with the sculpt tools it is not a problem. If I add a settings button to the top you could choose to add all of the various useful colour tools - like HSV bars, Swatches, Recently used colours. Or if you are happy with a simpler view you could remove the RGB bars for a smaller panel. Also would be nice to have type in boxes for RGB, HSL, Web colors. Perhaps there should be 2 versions of a panel, the settings could have 2 columns of tick box options. And a single click on a toggle in the header bar for a panel switches you from 'lite' to 'detailed' controls when you need them. I've used that system before in Fractal Painter seemed to work quite well. In fact there should be 3 versions of a panel - the other one is just a named title bar where the whole panel is collapsed, but it is still there in the UI for when you need it. Some apps will take the 'minimised' panels and put them in tabs onthe top or down the side. I quite like them minified and staying in place in the docked column. The other option is to have a button that popups the full control list temporarily so you can tweak the values then let it disappear again. I suppose I can try out both and see what feels best (possibly keeping both methods). I would use the KISS method on this one ... Keep It Simple, Stupid. A color picker has no need to be over complicated and painting with a right-mouse button on a stylus is no fun. Instead, just make the color picker similar to what you see in Photoshop and other paint apps. There is a foreground and background color option and you can switch between them by clicking one or the other. In most cases, it's just used as a simple way to store two colors for quick access. In other cases, it's a quick access to a background color for tools that use/require a background color. If you want people to store more than one color for use, then add a palette where people can store lots of color squares for easy access. Yes on the KISS. It is already a bit complicated in that the Colour Wheel sometimes shows a painting colour, and at other times shows various material colours and the backdrop colour. I need to make that selection more obvious. I think other apps would have the colour purpose in a tab, or even duplicate the colour wheel for each material attribute. It's getting quite easy to mess up the workspace with silly numbers of docks and panels now. I need to add some of the auto-hiding auto-minimising code to shuffle away panels that aren't currently relevant or don't easily fit. Simon, long time no update. How's the development going? I'm working on some very tedious UI stuff now. Where you open a popup from another popup, and it has to draw on top of the other panels around the screen. Necessary but dull! I really want to get back into some actual sculpting to help me think about how best to reorganise the tools and commands. I have lots of ideas but it is slow going. The "Groups" panel also needs a revamp, I really want to make it easier to work with scenes with lots of objects, and also remove the need to setup a group to do a menu operation. I'm making some promising progress on Drag & Drop and Copy & Paste of files into Curvy. I hate digging around in file open dialogs - so it is quite a relief to be able to use the normal file explorer windows and pick and choose what to drop in Curvy. This is especially useful when making use of large libraries of images and models. You can simply drag multiple files onto Curvy to import/load them all. Totally happy about the new release coming up! I think Curvy 3D is the best 3D program out there. Howler is the best paint etc. Program. Both together are total magic. My instincts say that the sidebars should be much more powerful, but not so customisable that they keep moving things around so I get lost. I think a lot of commands and options that are currently in menus make more sense as sidebar panels, where you can change the settings and options and try out and repeat commands a few times while you get a certain operation correct. I'm still bouncing between UI's I like and those that are suitably complex for 3D work. I've never been a fan of 3D UIs, I have a very small "working memory" so need to be able to find and access features easily or I will forget how. I also have very low patience for having to dig into submenus to access tools/commands (especially if it involves searching for the thing I need). At the moment the 4.0 UI is not meeting these sort of aims. 5) One use popup panels with settings and controls for a single command/action. eg: An Image Inflate dialog, that supoports live edits to values. 7) Is anything harder to access than that? Well... there are all the commands that require a special parent-child relationship. Now, the way I'm planning it all the above should be just a default UI setting - with the possiblity to mod this workspace into a much wide variety of setups, including home-brew panels, custom shortcuts, and perhaps alternate ready-made UIs for tablet use. The UI is starting to slot together. I have 9 top level "Activities" that each are associated with a family of tools and commands that can be accessed through the side panels. Narrow Activity Bar - To access the Activity sidebars, and a few TBC favorite tools/commands. Dedicated to a group of tools and commands that are often used together should simplify and speed up the workflow. Plenty of room for special use panels that might tweak a single tool/command. 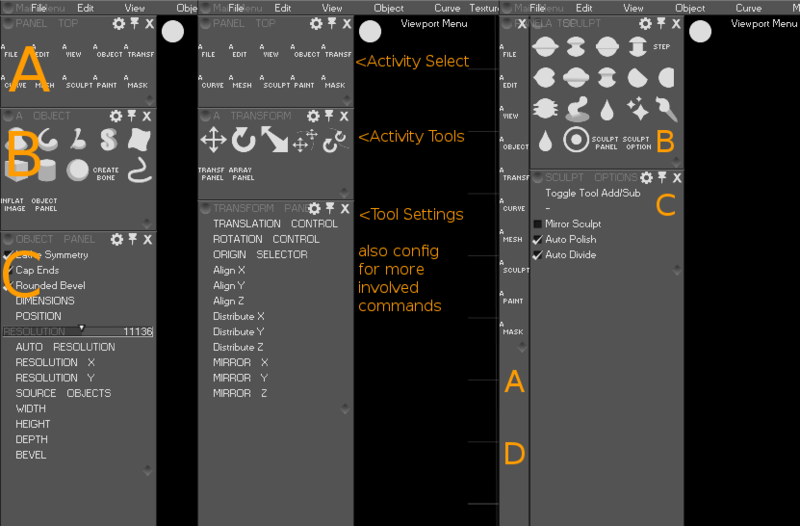 For example a range for settings and type in boxes to do all kinds of precise transform and alignment work. I'm planning to design my first version around fairly advanced user - with lots of icons, and little text. But to help learners you will eventually be able to open the same panels in a verbose format with icons and full names for each command - perhaps even descriptions, usage tips and example screenshots in a kind of "function browser". Hopefully that will encourage exploration and aid learning the icons. For even more advanced users the UI may disappear, only to be summoned by a hotkey when you need it (Like the 'V' menu, it will open the current activity's popup, with links to switch activity if needed). Overall the move is away from Menus, although they will still be available as a kind of backup reference system if you need to find a command easily (but slowly). In normal use the menu bar at the top can hide away, again giving you access to the whole screen. The Right Sidebar is still being redesigned, especially with regards to how the groups and layers work, and some of the Object Properties options will probably move into an Activity panel (or top/bottom bar), leaving the Right side more optional if you want the screen space freed up. This is my current thinking. C) When you select a specific tool/command any more detailed settings are here, also if you select a family of commands, like "Voxels" you can access all the commands and settings together here. This also gives room for more interesting object setups, and can give access to specific commands based on the selected object or curve. If you prefer you can access most of this through key shortcuts, use the panels in a floating undocked mode, and arrange them where you like. I imagine the really frequently used stuff will want key shortcuts, followed by toolbars, and the rarely used things in menus - although the menus should get a lot shorter now the bulk of the options and settings will move to dedicated panels. If you are using other shortcuts to access tools, the sidebar will still keep in sync - so if you pick the Move tool (eg: press 'W') you will have instant access to the type-in transforms, align & distribute, mirror and those kind of "Movement Activities". The UI elements don't mind where they are assigned to - it may be that some of these panels are better suited to floating popups, or docked as top or bottom bars. And the UI also doesn't care if a particular control is a icon, or a text button, so there is scope for working out what sort of layouts are best for learners and advanced users. 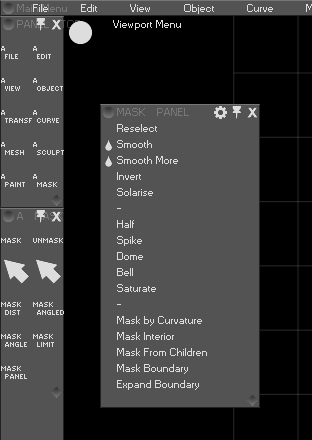 Indeed I think it may well help to create a "Beginner" version of the UI with less controls and more labels. I quite like this layout too, with activity & tools/commands for that activity stacked in a 1 or 2 icon wide toolbar on the left, and any tool properties/command popups in a floating and easily closed panel when required. A big improvement over 3.0 is that you will be able to easily access "Menu Commands" from the toolbar too. So when you build your own toolbars, panels, key-shortcuts they can access the full breadth of commands in Curvy. I think the above layout ideas will work towards bringing 4.0 to Beta, but only as a functional starting point. I think there is a long way to go to make sure Curvy remains welcoming and easy to learn - while at the same time beefing up the sophistication for established users. In any case, to aid the discussion I plan to get a rough beta available in September for Curvy regulars.